In these lessons, we will learn how to write algebraic expressions for word problems. We will start with some common phrases found in word problems. The following table gives some common words or phrases that are usually imply one of the four operations: add, subtract, multiply, divide. However, depending on the word problem, there are exceptions. Scroll down the page for more examples and explanations. To write an expression, we often have to interpret a written phrase. For example, the phrase “ 6 added to some number” can be written as the expression x + 6, where the variable x represents the unknown number. 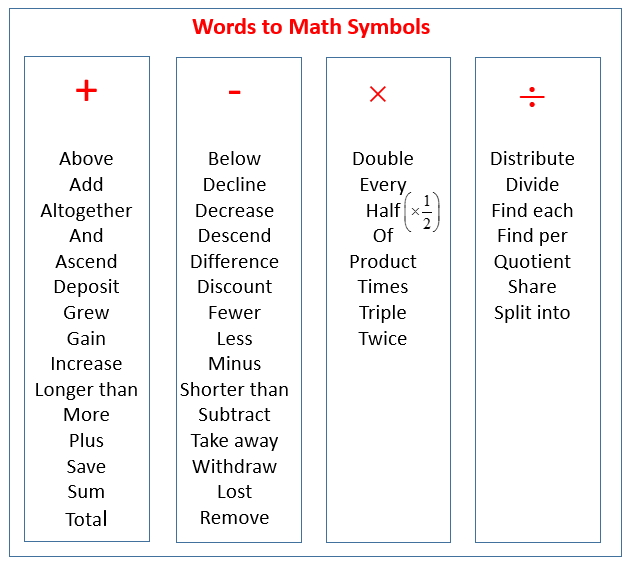 There are so many words that you come across when you're working on algebra problems, and these words are really code for very specific mathematical symbols. How to write algebraic expressions for word phrases, by analyzing the language used? An algebraic expression is a mathematical phrase that contains a combination of numbers, variables and operational symbols. A variable is a letter that can represent one or more numbers. How to write expressions with variables? Write the algebraic expressions to represent the statements. b) Take the quantity -3 times x and then add 1.
c) -6 plus the product of -1 and x. How to write algebraic expressions with parentheses? Now take the product of -8 and that expression and then add 6. How to Write Algebraic Expressions for Situations? Translate the following phrases into algebraic or numeric expressions. How to Write Equations from Word Problems? This video teaches how to dissect a word problem in order to define a variable and write an equation. 1: Half of a number is 16. Write an equation to represent the situation. Define your variable and solve. 2: Mrs. Gaddie has two dogs. Her friend Anna-Marie has three less than twice as many as Mtr. Gaddie. How many dogs does Anna-Marie have? 3: A recycling plant recycles 2 tons of cans yesterday. This is a third of their usual amount. How much does the plant usually recycle?